Cheryl Tiegs was a prominent model during the late 1970's, known for gracing the cover of the Sports Illustrated Swimsuit Issue 3 times during her illustrious career, which garnered her an iconic status among many. But has anyone seen what the aging beauty looks like today? It seems quite clear that she has decided to wage war against the natural aging process, in the form of plastic surgery. Most notably her cheeks seem to have taken on a new shape, which would lead one to believe she had cheek implants. 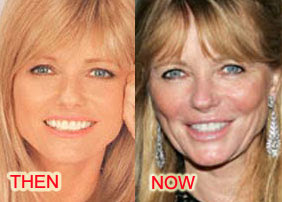 Cheryl Tiegs before and after picture. Cheryl Tiegs has also appeared to have added some enhancement to her lips as well, perhaps lip injections were on the menu? Despite vehemently denying any plastic surgery procedures, its really hard to argue with the before and after picture. Cheryl, the public isn't stupid! Of course you've had work done on your face & body. Just look at the before and after pictures of you. In your modeling days your lips weren't prominent. Now they looked ridiculous! Lying to yourself, ok. To the public, we're not buying it! OF COURSE SHE HAD PLASTIC SURGERY - WHO CAN STAY 20 FOREVER? SHE LOOKS GREAT,BETTER THAN MOST WOMEN HER AGE. WHAT MAN WOULD NOT WANT TO BE WITH HER?